Screens are a part of our lives from sunup to sundown. Although for many their social lives and livelihood depend on them, it’s extremely hard on your eyes. In fact, a study revealed that the majority of people working on computers had experienced vision issues related to prolonged staring at a screen. The most common eye-related issues that patients reported were red eyes, twitching, fatigue, and blurring. It’s recommended that we all have an eye checkup at least once a year. During the examination, it is important to tell your doctor how often you use the computer — citing the number of hours per day, and the number of days per week. It will help early detection of these issues while helping to prevent worsening of any current damage. Screens can be as bright or as dim as we want. But this doesn’t mean you should be reading on a computer in the dark. Working in the dark can lead to eye fatigue and blurred vision. Turn on the lights to get ample of lighting. However, natural light is best, so try to have your computer near a window. Glare can occur from two things: excessive lighting or reflective surfaces. Reflective surfaces could include mirrors, shiny tables, bright colored walls, and even the screen of your computer and phones. To avoid glare, place an anti-glare screen on your monitor, and matte screen protectors for your phones. If you have to sit a computer screen all day, follow the “20-20-20” rule. This rule means taking a break from your computer every 20 minutes. Stare at an object that is 20-feet away for 20 seconds or more. According to studies, following this rule helps to prevent dry eyes and blurred vision. Before working, consider the brightness of your screen and font size. Each has their own comfort level, and adjusting your monitor is easy. Make sure that the brightness of your screen is similar to the brightness of your surroundings. If working on long documents, make sure that the font size and contrast are suitable for you. According to some experts, font size should be three times larger than the smallest font you can read. 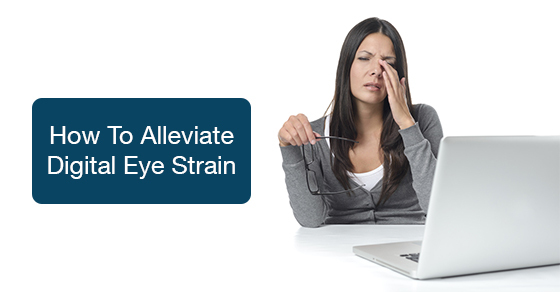 Using these simple tips, you can help reduce any eye discomfort.